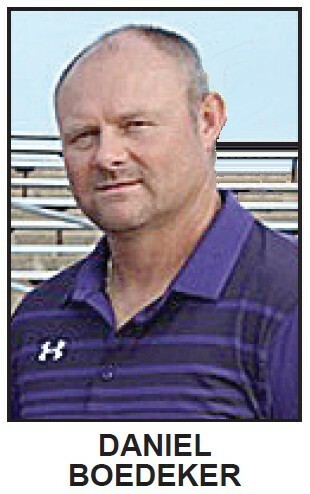 Daniel Boedeker was named the new Shiner High School Athletic Director and Head Football Coach on Tuesday (March 26, 2019). He will replace retiring AD/Coach Steven Cerny at the end of this school year. Shiner ISD did not look too far for its next Athletic Director/Head Football Coach. At a special meeting of the school board on Tuesday morning ( March 26, 2019 ) at Shiner ISD Administration Building, current Shiner head baseball coach Daniel Boedeker was named Athletic Director and head football coach starting with the 2019-2020 school year. He will replace longtime athletic director Steven Cerny who will be retiring at the end of the current school year. Superintendent Trey Lawrence recommended Boedeker for the position. Board president Andrew Schacherl made a motion to accept Lawrence’s recommendation for Boedeker as athletic director/head football. Board member Brandon Siegel seconded the motion and the motion passed unanimously 6-0. Boedeker, who also has served as assistant football coach, graduated from Shiner and has been teaching and coaching for the district since 2000 and looks forward to the challenge of leading Shiner athletics to continued success. With a long tenure of serving underneath Cerny, Boedeker does not expect a lot to change once he offi cially takes over. For Lawrence, Boedeker had been the frontrunner for the job.